Please come in and have a visit. Some people call it making medicine – the process of following your heart, creating something magical, powerful, and fulfilling. 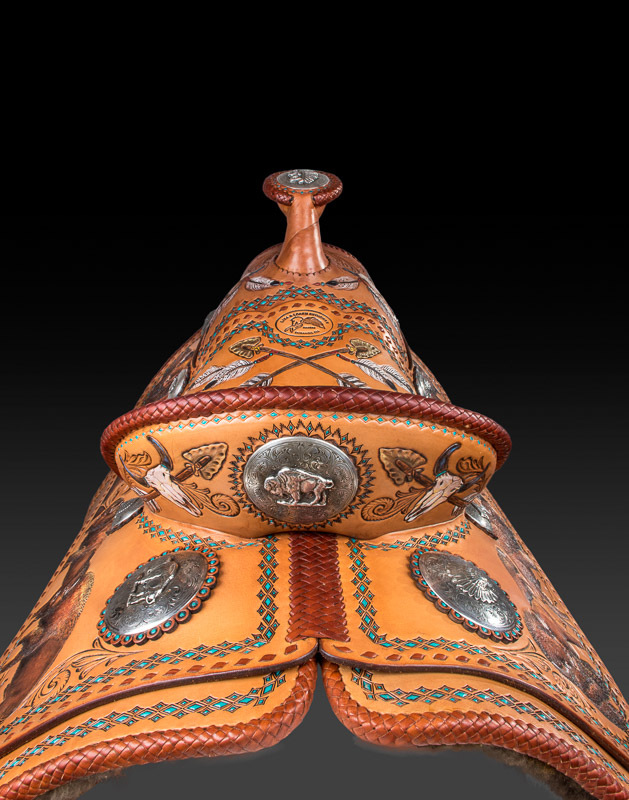 That is what saddle making and leather working is to Lisa and Loren Skyhorse. 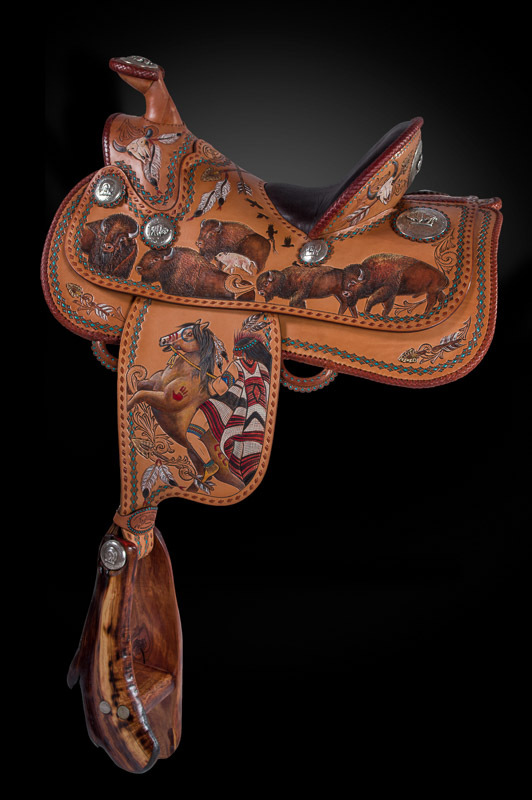 The couple has focused their artistic efforts on riding saddles for forty years now which makes them experts in their field. 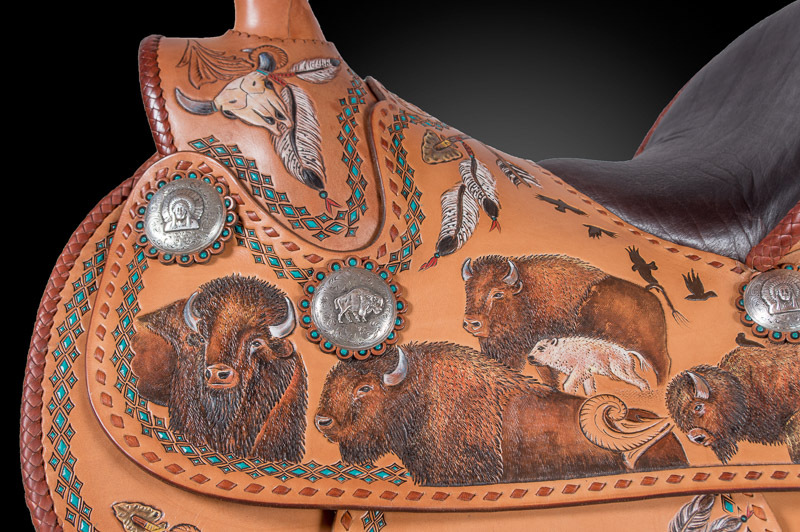 The White Buffalo saddle is just one in their Collection series. You can see how Lisa’s artwork expands on the over-sized fender and the seamless seat and rear jockey combination. The hand tooling creates realistic shapes and hair detail that is finished with intricate painting. Even the border stamping is hand painted reminiscent of turquoise beading. Loren’s lacing completes the edges with both edge braiding and buck-stitching. Lisa and Loren even lined the skirts with hair-on buffalo and used buffalo in the padded seat to retain the theme. The extraordinary sterling silver conchos were created by Sunset Trails silver company using dies from the 1920’s to form the buffalo and chieftain heads which complement Lisa’s beautiful tooling. Finally, the stirrups were assembled from 2000 year old alligator juniper collected in the New Mexican desert. 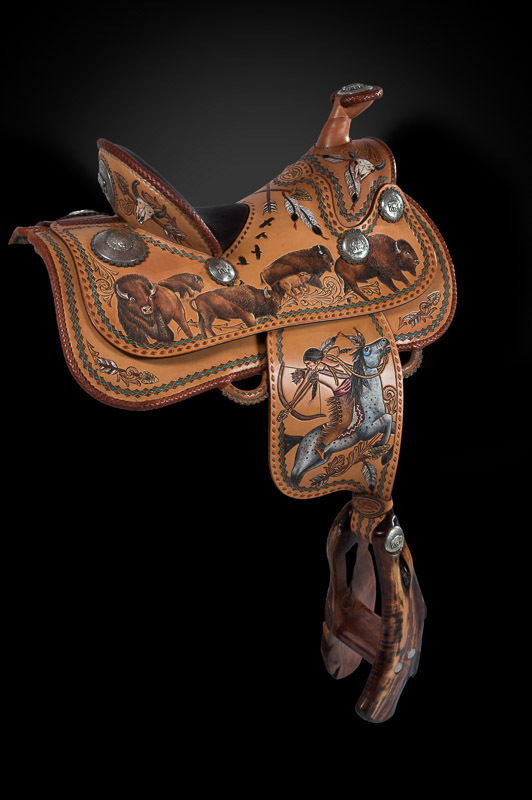 This museum worthy collector saddle has given the new owner some serious bragging rights. Are you interested in other incredible works of art by Lisa and Loren? Go ahead and get in touch with them at Skyhorse Saddles, Box 4317 Durango, CO 81302, 970.385.7660 or www.skyhorse.com.